It’s been some time since I’ve written anything on this page – I’ve been busy keeping a variety of social media profiles active for work, which always leaves me with little energy for my own profile (and I’ve been growing and tending two small humans too, which pretty much takes up all my non-office-time these days). Anyway, I’m delighted to say that I’ve just taken up a new role at UoE in which I think I’m likely to encounter lots of interesting research-related problems to think through and share. I’m now leading a team of research facilitators who will work with researchers across the University to ensure they are getting the most out of the digital services that are provided, and to ensure best practice is encouraged in using data, services and other resources. We made a start this week trying to fully understand the workings of EDDIE, the HPC cluster here – fascinating stuff, in which our initial questions are just leading to even more questions at the moment. I plan to write a post on the challenges of getting Hums researchers using a service like EDDIE some time soon. I’ll also be engaging with research community events on a much more regular basis, so may well find time to share thoughts about those. Realistically though, it’s still going to be sporadic writing from me, and even then, as another Doonhamer once said, best laid plans gang aft aglay. Last week I had the pleasure of visiting the Lothian Family History Society, who meet just outside Edinburgh in the Lasswade Centre. It was a lovely opportunity to meet some of the people who have interests in the Statistical Accounts, and another chance for me to delve into the content of the Statistical Accounts and explore the kind of interesting descriptive details they contain. A great deal can be gleaned about our ancestors in the late 18th and early 19th century through these reports. I thought it would be fun to focus on the parish in which we were present, so had a look at the two Lasswade accounts. The name Lasswade “signifies a well-watered pasture of common use”,* according to the Rev. M. Campbell MacKenzie, who complied the parish report for the second account. And well it might, given the position of Lasswade directly on the river Esk, in what is now the green belt around Edinburgh. 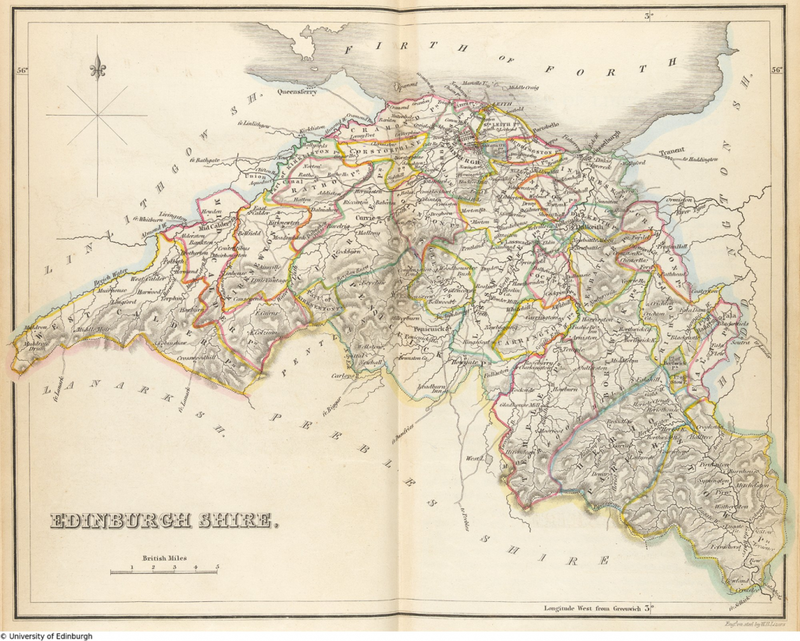 In the first account, we learn that the population in 1791 was more than 3000 inhabitants, so the village was a good size. There is plenty of work: agriculture is thriving and bleachfields, coal mining and paper making are the main (non-agricultural) industries with 260 people employed in the latter two. Around 150 women are employed as coal bearers underground. Only 50 people were claiming poor relief: the income from the church collection and fees (for weddings etc. ), we learn, was supplemented by the heritors of the village: “This mode they prefer widely to an assessment, a measure which ought always to be avoided, if possible, as it never fails to increase the number of claimants. There is a laudable spirit in the common people of this country, which keeps them from applying for aid out of the poor funds, so long as they can do anything from themselves. This arises from the apprehension that these funds depend for their supply solely on the voluntary contributions at the church door.” One of the common pastimes, the minister notes, is gardening: “the attention of the gardener is chiefly directed to the cultivation of strawberries, than which he has not a surer or more profitable crop […] It may be observed that it was in this parish that strawberries were first raised in any quantities for the public market.” So one of Lasswade’s claims to fame might be as the home of the commercially grown strawberry! Half a century later, in 1841, Lasswade had a population of 5022: it had not quite doubled in size, but it had certainly increased. The growing parish had also been divided into two by this point, at least quoad sacra (in a spiritual sense) but ‘temporal matters’, quoad civilia, were still common to both. Manufacturing in the area is now dominated by paper (c. 300 people) and carpets (c. 100 people). But despite the growing populace, and the 75 on the roll, and a considerable number of people who receive occasional assistance. There is an assessment, so the Heritors have evidently given up on their custom of supplementing the Church collections, which is perhaps unsurprising given the 50% increase in claimants. Gardening continues: “vegetation is both early and luxuriant” and by this time, we learn, the green charms of the area have rendered “the village of Lasswade a place of considerable resort to the inhabitants of Edinburgh and Leith numbers of whom annually spend the summer months in this delightful locality.” Perhaps in keeping with its growing reputation as a notable locale in the area, the Lasswade report in the second account devotes a significant proportion of its pages to discussion of the lives of ’eminent characters’ and fascinating antiquities. The former include the poet William Drummond of Hawthornden, Mr Clerk of Eldin, author of an important essay on naval tactics, and the late Lord Melville. The latter feature notable sights such as the caves below Hawthornden which could hold upwards of 60 men and were used to conceal troops during “the contest between Bruce and Baliol” and “the famous sycamore tree which is called the fours sisters and is about 24 feet in circumference at the base. It was under this tree that Drummond the poet was sitting when his friend Ben Jonson arrived from London, and hence it is also called Ben Jonson’s tree.” Such points of historical interest might appeal to the kind of metropolitan visitor that Lasswade was now attracting, and – like the second account report for neighbouring Roslin, which is given over almost entirely to a description of the ornamental chapel – it reads more like a tourist guide than a survey of the people and the land! Stewarding Scholarship: Should we leave archiving to publishers? The shift to digital publishing has had revolutionary effects for researchers. Libraries licence e-journals from publishers, who provide quick and easy access form their online platforms. This enables students and lecturers to get to the articles they need easily and conveniently from their laptop or office. In terms of access, the picture is rosy. It is less so, however, when it comes to the long term. Continuing access and preservation have traditionally been enabled by the collecting activities of libraries who took a stewardship role in relation to the scholarly record. As publishers now only licence access to their content, and academic libraries no longer hold their own copies, the provision of post-cancellation access and archiving falls to publishers whose concerns are typically commerical. 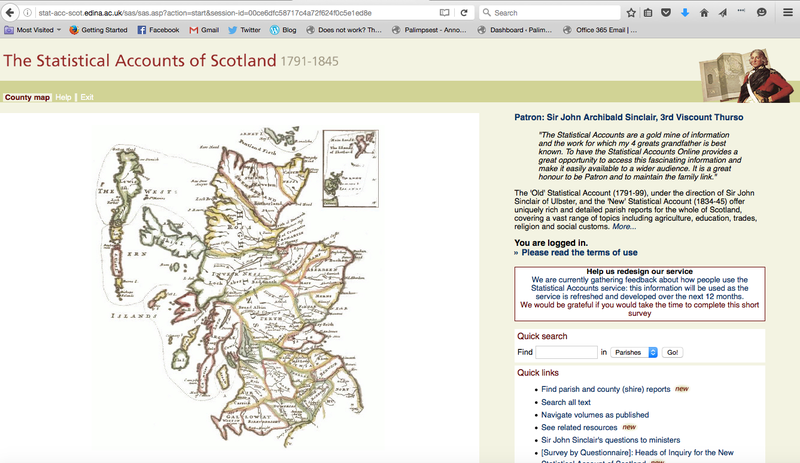 I’m really pleased to have been assigned responsibility for the Statistical Accounts of Scotland Online, a pioneering digitsation project that has been online for around 15 years (meaning it has been very long lived and successful! ).The accounts are absolutely fascinating documents – written by the ministers of Scotland’s parishes, they provide detailed, local descriptions of life in late 18th Century and early 19th Century Scotland. This period of ‘Enlightenment’ and ‘improvement’, encompasses the agricultrual and industrial revolutions and thus witnessed radical and dramatic social change. In this role, I’m going to be managing the redevelopment of the metadata, backend and interface of this important collection. You can follow our progress and learn more on the service blog. I attended UKSG in Glasgow this week, my first professional rather than strictly academic conference. UKSG is a huge event, attended by all sorts of people who work with academic serials and scholarly publishing, and there was plenty of opportunity to meet other service providers and publishers, as well as librarians from around Europe. It was clearly a great opportunity for the library community to share knowledge and best practices, and to showcase their institution’s projects and innovations. I found myself in more familiar territory with the keynotes, with their more theoretical concerns about academic reward systems, digital innovation and the ethics of open access. I particularly enjoyed Geoff Bilder’s talk, which took a polemic postion to argue that the conference topics — open access, data metrics, reproducibility– were straw men that distract from a much deeper problem. Pointing to the issue of how ‘publish or perish’ distorts the scholarly communications ecosystem, he talked us through data that showed the difference in number between ‘first time authors’ and ‘repeat authors’, data which suggests that around 80% of academics author one article and then cease to produce more, and data which showed the number of qualified researchers who leave academia to pursue careers elsewhere (apparently only a shocking 0.45% remain in the sector in a permanent post over the course of their career). Other highlights were the sessions on Humanities attitudes to open access and altmetrics. Recordings of all the talks can be found here. I’m speaking at an event in Glasgow next week, focused on careers beyond academia for those with Humanities PhDs. I feel a bit of a fraud in some ways, as I’m still employed in a ‘alt-ac’ kind of role, working in a university and continuing to do many of the same kinds of activities as I did as an academic. However, I do recall how intimidating it felt to be looking at ads for ‘professional’ jobs and wondering if my application would be taken seriously and what it felt like to be attending interviews in which I had to really draw out connections between my experience and the role requirements that did not seem obvious to the interviewers. So I’ll be sharing some insights into the approaches I took, and the help I sought out. Perhaps I’ll find time to write it up for this blog at some point too! The event is on 14th May, at Glasgow Caledonian University, and it’s organised as part of the Young Academy of Scotland. I’ve recently accepted a new job, a Project Officer post at EDINA which is a national data centre supported by Jisc and based at the University of Edinburgh. It’s a bit of a side step for me, but in some ways a logical one, as I’m effectively just taking my research interests in digital technology, book history, archives and publishing into a different professional context. I’m going to be supporting projects that focus on developing bibliographic and mulitemedia services for the higher education sector in the UK and internationally. I’m looking forward to formalising some of the project management skills I’ve developed in the last few years and to learning more about software and service development. I’m delighted to have been asked to chair this panel discussion on the 29th of November, at an event that responds to the Cooper Gallery’s current exhibition ‘Anna Oppermann: Cotoneaster horizontalis.’ Opperman’s fascinating work attempts to map processes of cognition, tracing loops of response, reflection and reiteration in her fascinating ensembles. As the gallery writes, “process formed an integral part of Oppermann’s practice and she carefully produced an archive of material documenting her production method. By drawing on the artist’s archival intention, the exhibition [explores] how to activate archival materials within a discursive exhibition situation and the role of new technologies in archival practices.” The speakers will share their insights into the art world and practices of Opperman’s time, the 1970s and 80s, and reflect on how her work speaks to our own historical moment. Among them will be Professor Martin Warnke and Carmen Wedemeye, who produced a digital archive in response to Oppermann’s complex ensembles, which can be accessed in the gallery, creating another context and iteration of her work. Details of the event can be found here. Next week I’m attending a five day workshop as part of DHOxSS. It’s taught by staff from Oxford, as well as colleagues Illinois’ Center for Informatics Research in Science and Scholarship and the HathiTrust Research Center. It’s going to cover conceptual frameworks and ontologies, data curation, management and modelling, accouting for provenance, repositories systems and sharing, among many other things. It’ll be lovely to be back in Oxford and to expereince the summer school environment again: last year I did the Introduction to Digital Humanities workshop, which gave me a great taste of a whole vareity of differnet methods from text-mining to multispectral imaging.